Camel’s Hump Nordic Ski Center, as it was known when Dave Brautigam and Myra Handy established the area in 1979 and cut the Honeymooner trail, has been the beneficiary of a uniquely supportive cast of friends and neighbors. 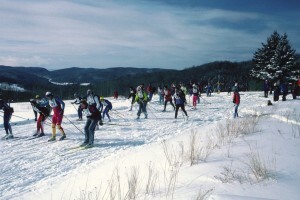 Over the years, more than thirty landowners have helped piece the trails puzzle together by making their privately-owned farm and woodlands consistently available to the skiing public, and countless volunteers have contributed in the construction and maintenance of the trail network that now spans over a thousand acres of private land and spills onto the public land of Camel’s Hump State Park. Dave and Myra, inspired by the “back-to-the-land” ethic of the late 60’s and 70’s, settled on the Huntington hill farm owned by Myra’s parents, Jack and Jane Handy, and quickly went to work carving out a ski trail network, including the early Honeymooner and Echo Woods trails. Jack and Jane, who lived in a neighboring home on the farm, encouraged and participated in the new venture. Jack Handy came by his love of cross country skiing after serving in the ski troops of the 10th Mountain Division during WWII, and he later pursued his love of cross country skiing while the Headmaster of the Stowe School in Stowe, where he founded a popular cross country ski race called the West Hill Run in the early 1960’s. At about the time that Dave and Myra settled in Huntington in 1979, they were able to purchase the 150-acre woodlot bordering the Handy farm and linking with Mark and Marijke Smith’s Windekind Farm to the south. This allowed for the construction of the Gullywhumper trail, the primary groomed connector between the Handy and Smith farms, and Cobble Hill, Dead River Run and Marijke’s Mainline followed soon after, as the network grew outward to embrace neighboring Windekind Farm. White’s Way, Loggers Loop and Woodchuck Ramble soon appeared as well, as the farm and woodlands of third-generation Huntingtonian, Bert White, were incorporated into the trail picture. As of this writing, there are currently sixth generation Whites occupying this same landscape. To the north of the Handy farm, land owned by the family of Commodore Jaques, a major figure in the 20th century history of the Town of Huntington, forms the backdrop and landscape for the Echo Woods and Lost Farm Loop trails. Dave and Myra ran CHNSC from the basement of their home as a small, but popular, ski area until 1996. The basement became a cozy gathering place for local skiers, with a fire burning in the big, stone fireplace and hot soup and Norwegian “boler” available to hungry skiers. During that time, young August and Noah grew up skiing and exploring the trails, woods, and hills around their mountain home with their parents and grandparents, later moving on to compete in NCAA intercollegiate Nordic ski racing for their respective teams at the University of Nevada-Reno and Middlebury College. Babben Enger teaches downhill technique in an early ski school lesson from 1990. It was at about that time that Jerry Gange and his wife, Babben Enger, moved from Babben’s native land of Norway back to the US, where they settled in Huntington. After winning a gold medal at the 1968 Winter Olympics as a member of the Norwegian women’s 3x5km relay team, Babben came to the US to help the von Trapp family get its famed Nordic ski area off the ground. Jerry and Babben met while working at Trapp Family Lodge in Stowe during this period in the early 1970’s. After spending time in Norway, they returned to the US and their new home in Huntington, and it was from this Nordic home on the south end of the trail network (now The Sugarbush trail) that Babben regularly skied to the ski center to run the Camel’s Hump Nordic Ski School and teach local youths for many years. When Dave and Myra ended their run as owners of Camel’s Hump Nordic Ski Center in 1996, a volunteer group determined that they wouldn’t let the ski center disappear. 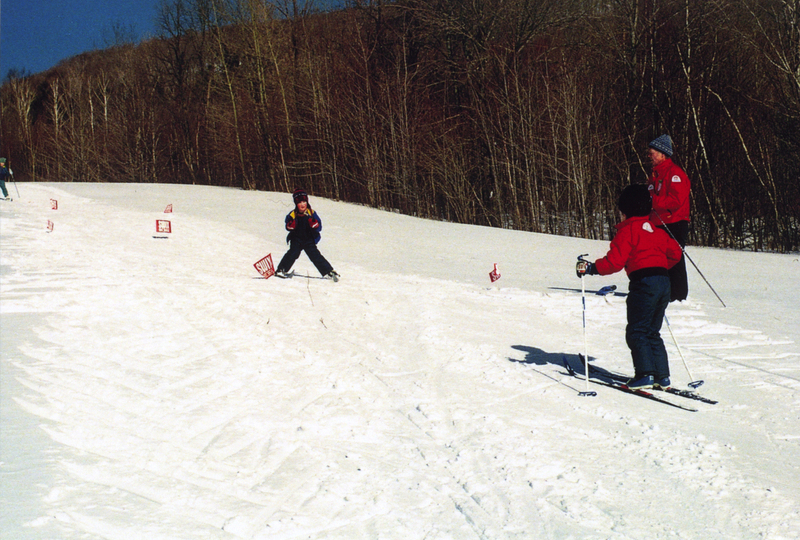 That fall, the non-profit Camel’s Hump Skiers’ Association was born with the help of former friends/neighbors/trailgroomers, John Hadden, Marc Torelli, and Jerry Gange, who did the legal legwork in establishing CHSA and becoming its founding officers. CHSA has now grown from a small, but loyal group of local neighborhood volunteers to a membership of about 100 (and counting) individuals and families from Huntington and nearby towns of the greater-Burlington area, with a directing Board of nine local and active skiers. The organization changed its name to Camel’s Hump Nordic Ski Area in 2010, and we just recently (February, 2011) learned that the IRS has recognized CHNSA as a charitable, tax-exempt 501(c)(3) non-profit organization. With this recognition, CHNSA is now able to apply for trail grants and undertake a Capital Campaign to help realize our goal of bringing a diverse, high quality AND affordable skiing experience to all those who wish to explore the thrill and beauty of the Camel’s Hump region in winter.